If you are missing teeth, or have dentures that do not fit properly, it’s hard to smile with confidence. Don’t wait to find your winning smile. Take the first step – book a consultation with Denturist Victor Minas, DD, FCAD(A) and the Smile Corp team of dental specialists, no referral required! This includes making, placing, and repairing removable prosthesis, such as dentures and overdentures (Snap-On teeth) as well as the services provided by a Dentist and Dental Specialist, which include implant surgery, clear braces, and dental crowns. Don’t suffer with a less-than-perfect smile – visit Smile Corp and share yours with confidence! Your Smile Corp team works closely with you to ensure a smooth process, beginning with your initial consultation and continuing through to treatment options, dental implant or denture prosthesis design and manufacture, performing your procedures, and necessary follow-ups. Listening to your concerns and answering your questions during every step are top priorities for us. Dentures are used to replace missing teeth. Because everyone’s mouth and oral health is unique, there are three types of conventional dentures available: full dentures, partial dentures, and overdentures. Traditional full dentures (also known as “complete dentures”), replace the entire top or bottom teeth within your mouth. A traditional full upper denture is typically held in place by suction, and covers the entire roof of the mouth. The full lower denture fits over your bottom gums only without suction. Partial dentures can be used when you have existing teeth, but you are missing one or more teeth on the top or bottom of your mouth. Missing teeth are replaced by the partial denture, and metal clasps are secured to the adjacent teeth to keep the partial denture in place. Overdentures, also called “Snap-On teeth”, are a more secure option than traditional dentures. Overdentures snap into place over ball-shaped implants, resulting in a tight-fitting, comfortable denture that doesn’t require messy adhesives or rely on suction to stay put. Overdentures can be full or partial overdentures, although full overdentures are more common. Traditional dentures, partial dentures, and overdentures are considered removable prosthesis, as they can be taken out at night and for cleaning. If you already have dentures, Smile Corp also provides reline and repair services. If you have broken or missing teeth on your denture, or your dentures don’t fit properly, Smile Corp can repair or reline your dentures, often with same-day service. Smile Corp is a full-service denture clinic with all repairs and relines performed onsite in our state-of-the-art dental laboratory, so our high standards are always met, quickly and efficiently. There are two types of teeth on implants: dental implants and denture implants. All On 4 implants and dental crowns, are secured to dental implants, and are a permanent solution. If traditional dentures aren’t your style, then denture implants may be an option. Snap-On teeth are removable prosthesis, which you can easily remove for cleaning and maintenance. Both dental implants and denture implants are effective solutions for missing or failing teeth. Your personal preference, implant cost, and the current state of your oral health will help guide your Smile Corp team to the best options for you. After the initial consultation, your Smile Corp team will discuss all available options with you to decide whether dental implants, All On 4 implants, Snap-On teeth, or dental crowns are the right choice for you. If you need to straighten your teeth but you want a more discreet option than metal braces, Smile Corp offers PerfectSmile™ aligners. 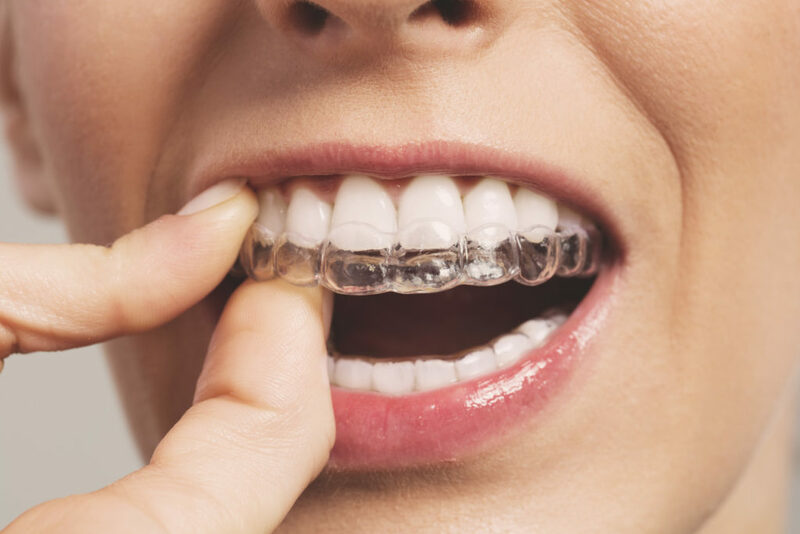 Similar to Invisalign™ but manufactured in Canada, PerfectSmile™ clear aligners (or “clear braces”) are nearly invisible, and do not affect your speech or daily activities. These clear aligners are cosmetic, thin, comfortable, and removable. They are worn day and night, but they can be easily removed when eating and brushing. Each set of teeth aligners is replaced with new aligners every two to four weeks, depending on your required program. A common question we hear is “How much do dentures cost vs. the cost of dental implants?” At Smile Corp, we understand that dental procedures can be expensive. But we provide you with the best, cost-effective options for your optimal oral health. If you have benefits coverage, we work directly with your insurance company electronically, and complete all required paperwork for you. We also offer payment plans and arrange financing, so you can improve your smile now without worry. As a gateway into the body, your oral health is an important part of your overall health. Dentures, dental implants, and crowns should be viewed as an investment in yourself, as your whole body will benefit. And your beautiful new smile will be contagious! Services include denture service (with dentures created onsite), dentures secured to implants (“Overdentures” or “Snap-On teeth“), All On 4 dental implants, PerfectSmile™ clear braces (similar to Invisalign® but manufactured in Canada), and many other denture and dental implant services to help you share your smile more often. There’s no longer any need to go to your dentist first to receive a referral for denture implants or dental implants and wait for multiple appointments; at Smile Corp, we work together as a team to provide you with every service required from initial consultation to the placement of your dentures, denture or dental implants, without any referrals or outside appointments. And we manufacture all dentures and other dental prosthesis onsite, so you never have to wait! Take the first step – book a consultation with Smile Corp, no referral required!